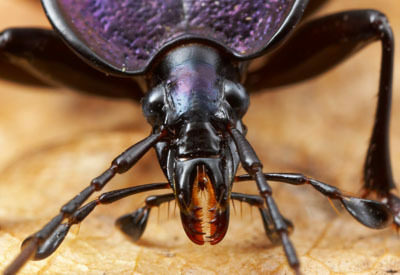 Have you seen Snail-eating Ground Beetles? In a joint effort to expand the knowledge and understanding of the flora and fauna of Polk County, Conserving Carolina and botanist David Campbell need your help in locating this month’s “Polk County’s Most Wanted—Animal.” This month’s challenge is to locate a unique and fascinating group of invertebrates: Snail-eating Ground Beetles belonging to the genus Scaphinotus. Scaphinotus are typically found throughout the northern temperate regions of North America, as well as mountainous regions further south, such as the Appalachians. 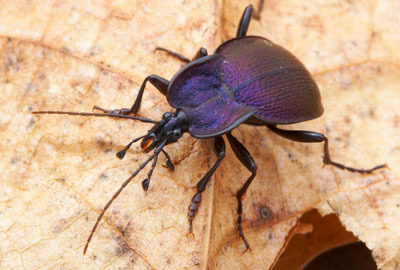 Beetles in this genus are quite large (over one inch) and have a colorful metallic appearance of purple, violet, green, or black. Another unique feature of Scaphinotus are their extremely narrow and elongated heads, as well as their modified mouth structures, both of which serve to aid the beetle in feeding on its favorite prey – snails. Given their dietary preferences, these beetles, not surprisingly, prefer cool, damp conditions often near streams or on steep slopes above streams or creeks. Scaphinotus are secretive and typically nocturnal so they are not often observed. Purposeful searches for these beetles may be made by looking under rocks and logs in damp ravines that are favored by snails, particularly at night. Oddly enough, specimens may sometimes be caught by setting out a bait of slightly fermented bananas (with a bit of yeast or beer added) along woodland trails in suitable habitat. Entomologists typically use pitfall traps to collect these beetles when studying them. In our region, there are well over a dozen species of Scaphinotus to be found, but their distribution and abundance is not well understood. Indeed, a previously unknown species of Snail-eating Beetle was recently described as new to science in Arkansas. The apparent rarity of these beetles is likely due to a lack of collecting effort, as opposed to actual scarcity. If you think that you have seen Snail-eating Ground Beetles in Polk County, please send photos, questions, or comments to Pam Torlina at Conserving Carolina by phone at 828-697-5777, ext. 300 or email, pam@conservingcarolina.org, so we can document its occurrence in Polk County. Photos by Alex Wild .